As Washington lawmakers tackle court-ordered education funding, much of the solution will come together behind closed doors. And legislators have exempted themselves from open-records laws, shielding emails or calendars showing their work. OLYMPIA — As Washington state lawmakers wrestle over how to provide court-ordered education funding, much of the solution will come together in backroom negotiations shielded from the public’s eyes. And while the public is allowed to seek records such as emails and calendars of other state officials and the governor, lawmakers have largely exempted themselves from public-disclosure laws. That means records that may show whom legislators are hearing from and what they are thinking can be kept secret. To test the exemption, The Seattle Times and public-radio Northwest News Network requested records from Democratic and Republican legislative leaders in both the state House and Senate. The requests sought the legislative calenders of Democratic House Speaker Frank Chopp and Senate Democratic Minority Leader Sharon Nelson, Republican Senate Majority Leader Mark Schoesler and Republican House Minority Leader Dan Kristiansen. Also requested were emails sent to and from those legislative leaders related to the state’s budget and school funding issues. At least a dozen other states require lawmakers to release some or all of their emails or calendar items, according to a review last year by The Associated Press. Initiative 276, which voters approved in 1972, created the state’s modern public- records laws. That initiative covered everything from open records to campaign finance and lobbying. But part of the language defining legislative public records in the law predates the initiative. In that definition, “reports or correspondence made or received by or in any way under the personal control of the individual members of the Legislature” are not public record. Lawmakers could waive that exemption and release records voluntarily. But the legislative leaders, through state attorneys, also declined requests for a waiver. Some legislators used to release emails and calendars, said Rowland Thompson, executive director for Allied Daily Newspapers of Washington. Only in the past few years have legislators asserted their exemption more aggressively, he said. It’s difficult to even get legislative leaders to discuss their exemption from open- records laws. Schoesler and Nelson did not respond to multiple requests for comment. Choppand Kristiansen declined requests for interviews. In separate statements through staff, Chopp and Kristiansen both said that they’d be willing to review how state records laws apply to lawmakers sometime after this year’s legislative session ends. The issue is so sensitive that one former lawmaker said he once was forced to withdraw a bill to open legislators’ records before it was officially introduced. Toby Nixon, a former Republican state representative, said he once drafted that proposal. An hour after starting the process of filing the bill, an attorney for the House told Nixon to withdraw it. Nixon said he withdrew the bill but still thinks lawmaker emails and calendars should be public. “I still think that the Legislature should have to live under the same rules as every other public employee,” he said. The rejection of the records requests by legislative leaders comes as lawmakers tackle a pair of critically important tasks this year. 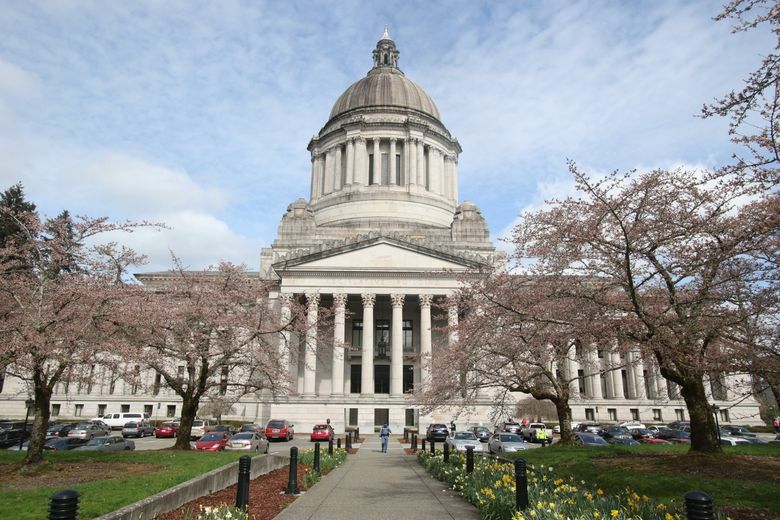 Lawmakers are drafting Washington’s 2017-19 state budget. That job is difficult in itself, with the Legislature going into several overtime sessions in recent years before the threat of a government shutdown prompted legislators to make a deal. But the stakes are even higher this year. Lawmakers are seeking to finish a multiyear effort to satisfy the state Supreme Court’s McCleary decision, issued in 2012. The justices ruled that Washington was violating its state constitution by underfunding K-12 schools. Resolving that case involves a mix of complex policy decisions, as well as politically painful choices to boost education funding, such as possible tax hikes, cuts to other programs — or a mix of both. Meanwhile, news coverage from other states shows the value of having access to lawmaker emails. Morgan Loew, an Arizona journalist, broke a story based on a lawmaker’s emails during that state’s contentious 2010 debate over immigration policy. Loew, with the Phoenix CBS 5 News, wanted to know more about the legislation, which required local authorities to enforce federal immigration law. The U.S. Supreme Court later struck down parts of it. Arizona’s laws require lawmakers to release records, and Loew was soon sifting through hundreds of emails. “What we found out from his emails was that he was preparing to author another bill, that would take away birthright citizenship here in Arizona,” Loew said. A few weeks ago, The Coeur d’Alene Press wrote about an Idaho lawmaker’s efforts to restrict public-records laws for legislators there. The lawmaker didn’t return calls, and so, “Ironically, it took a public-records request for the Dalton Gardens Republican’s email messages to find out what he was thinking when he proposed this legislation,” the newspaper reported. And this month, the Naples Daily News in Florida used email records to document how a state senator helped get $1 million into the state budget for a friend’s business. One lawmaker did waive her exemption and released her calendar and emails for this story. Rep. Melanie Stambaugh, R-Puyallup, said she developed an interest in public-records laws after an ethics complaint was brought against her for posting state-funded videos and photos to her re-election campaign’s Facebook site. Stambaugh, who was eventually fined $5,000, argued that those documents are public records and that the ethics rules haven’t kept pace with new technology. Since she has argued that at least some legislative documents are public records, The Seattle Times and Northwest News Network requested Stambaugh’s calendars and emails. In response, she released dozens of emails — while keeping some private — as well as calendar items for a month. Stambaugh isn’t a member of leadership and doesn’t sit on the House Appropriations or Finance committees, which are expected to handle big-ticket decisions on McCleary funding and the budget. But the records Stambaugh released shed light on what a legislator’s day looks like. Her calendar for one day in January, for example, notes one meeting about possible legislation, and another meeting with the Pierce County legislative delegation. In the evening, it shows the buffet of special-interest receptions available to lawmakers at hotels and meeting spaces across Olympia. Receptions that evening were scheduled by the Washington Realtors Association, Washington Council of Police and Sheriffs, the Society of American Foresters, and the Washington State Council of County and City Employees. Stambaugh also shared several dozen emails, with the names of senders redacted. They include a note from what appears to be an Amazon lobbyist referring to a meeting with Stambaugh. In some cases, Stambaugh said she believes an email or calendar item should be kept private. That could include sensitive private information, or an in-process deliberation, like an early draft of legislation. Otherwise, “I think they should be available to the public,” Stambaugh said, acknowledging that she’s only one of 98 members in the House. Rep. Terry Nealey, R-Dayton, Columbia County, said he worried that it would cost a lot of money to respond to and process open-records requests to the Legislature. “I think we need to have second thoughts about, is that where we want our taxpayer dollars to go,” said Nealey, who has been working on public-records legislation this year. Even so, Nealey acknowledges that state lawmakers have gotten a pretty rare deal with their exemption from a public-records law that applies to other local and state government officials. This story was produced in conjunction with Northwest News Network, a collaboration of public radio stations in Washington, Oregon and Idaho.